BY MAJ. JAMES B. MOORE [17th Georgia], CAMERON, TEX. 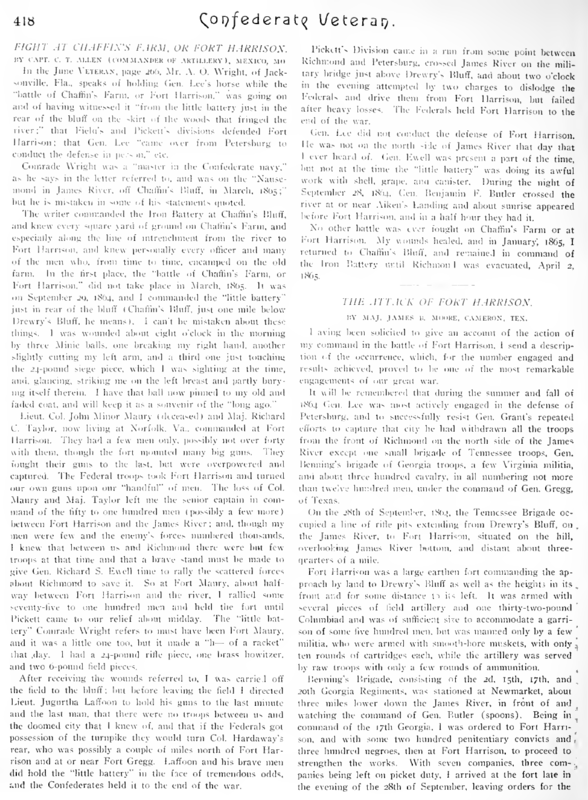 Having been solicited to give an account of the action of my command in the battle of Fort Harrison, I send a description of the occurrence, which, for the number engaged and results achieved, proved to be one of the most remarkable engagements of our great war. On the 28th of September, 1864, the Tennessee Brigade occupied a line of rifle pits extending from Drewry’s Bluff, on the James River, to Fort Harrison, situated on the hill, overlooking James River bottom, and distant about three quarters of a mile. Fort Harrison was a large earthen fort commanding the approach by land to Drewry’s Bluff as well as the heights in its front and for some distance to its left. 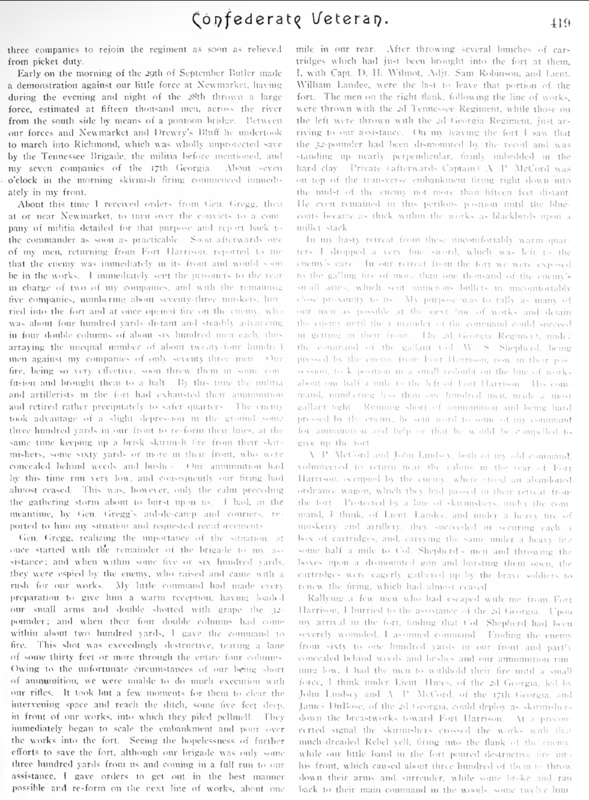 It was armed with several pieces of field artillery and one thirty two pound Columbiad and was of sufficient size to accommodate a garrison of some five hundred men, but was manned only by a few militia, who were armed with smooth bore muskets, with only ten rounds of cartridges each, while the artillery was served by raw troops with only a few rounds of ammunition. Benning’s Brigade, consisting of the 2d [Georgia], 15th [Georgia], 17th [Georgia], and 20th Georgia Regiments, was stationed at Newmarket, about three miles lower down the James River, in front of and watching the command of Gen. Butler (spoons)3. Being in command of the 17th Georgia, I was ordered to Fort Harrison, and with some two hundred penitentiary convicts and three hundred negroes, then at Fort Harrison, to proceed to strengthen the works. With seven companies, three companies being left on picket duty, I arrived at the fort late in the evening of the 28th of September, leaving orders for the three companies to rejoin the regiment as soon as relieved from picket duty. Early on the morning of the 29th of September Butler made a demonstration against our little force at Newmarket, having during the evening and night, of the 28th thrown a large force, estimated at fifteen thousand men, across the river from the south side by means of a pontoon bridge. Between our forces and Newmarket and Drewry’s Bluff he undertook to march into Richmond, which was wholly unprotected save by the Tennessee Brigade, the militia before mentioned, and my seven companies of the 17th Georgia.4 About seven o’clock in the morning skirmish firing commenced immediately in my front. About this time I received orders from Gen. Gregg, then at or near Newmarket, to turn over the convicts to a company of militia detailed for that purpose and report back to the commander as soon as practicable. Soon afterwards one of my men, returning from Fort Harrison, reported to me that the enemy was immediately in its front and would soon be in the works. I immediately sent the prisoners to the rear in charge of two of my companies, and with the remaining five companies, numbering about seventy three muskets, hurried into the fort and at once opened fire on the enemy, who was about four hundred yards distant and steadily advancing in four double columns of about six hundred men each, thus arraying the unequal number of about twenty four hundred men against my companies of only seventy three men. Our fire, being so very effective, soon threw them in some confusion and brought them to a halt. By this time the militia and artillerists in the fort had exhausted their ammunition and retired rather precipitately to safer quarters. The enemy took advantage of a slight depression in the ground some three hundred yards in our front to reform their lines, at the same time keeping up a brisk skirmish fire from their skirmishers, some sixty yards or more in their front, who were concealed behind weeds and bushes. Our ammunition had by this time run very low, and consequently our firing had almost ceased. This was, however, only the calm preceding the gathering storm about to burst upon us. I had, in the meantime, by Gen. Gregg’s aid-de-camp and couriers, reported to him my situation and requested reenforcements. Gen. Gregg, realizing the importance of the situation, at once started with the remainder of the brigade to my assistance, and when within some five or six hundred yards, they were espied by the enemy, who raised and came with a rush for our works. My little command had made every preparation to give him a warm reception, having loaded our small arms and double shotted with grape the 32 pounder, and when their four double columns had come within about two hundred yards, I gave the command to fire. This shot was exceedingly destructive, tearing a lane of some thirty feet or more through the entire four columns. Owing to the unfortunate circumstances of our being short of ammunition, we were unable to do much execution with our rifles. It took but a few moments for them to clear the intervening space and reach the ditch, some five feet deep, in front of our works, into which they piled pellmell. They immediately began to scale the embankment and pour over the works into the fort. Seeing the hopelessness of further efforts to save the fort, although our brigade was only some three hundred yards from us and coming in a full run to our assistance, I gave orders to get out in the best manner possible and re-form on the next line of works, about one mile in our rear. After throwing several bunches of cartridges which had just been brought into the fort at them, I, with Capt. D. H. Wilmot, Adjt. Sam Robinson, and Lieut. William Landee, were the last to leave that portion of the fort. The men on the right flank, following the line of works, were thrown with the 2d Tennessee Regiment 5, while those on the left were thrown with the 2d Georgia Regiment, just arriving to our assistance. On my leaving the fort I saw that the 32 pounder had been dismounted by the recoil and was standing up nearly perpendicular, firmly imbedded in the hard clay. Private (afterwards Captain) A. P. McCord was on top of the transverse embankment firing right down into the midst of the enemy not more than fifteen feet distant. He even remained in this perilous position until the blue coats became as thick within the works as blackbirds upon a millet stack. In my hasty retreat from these uncomfortably warm quarters I dropped a very fine sword, which was left to the enemy’s care. In our retreat from the fort we were exposed to the galling fire of more than one thousand of the enemy’s small arm, which sent numerous bullets in uncomfortably close proximity to us. My purpose was to rally as many of our men as possible at the next line of works and detain the enemy until the remainder of the command could succeed in getting in their front. The 2d Georgia Regiment, under the command of the gallant [Lt.] Col. W[illiam]. S. Shepherd, being pressed by the enemy from Fort Harrison, now in their possession, took position in a small redoubt on the line of works about one half a mile to the left of Fort Harrison. His command, numbering less than one hundred men, made a most gallant fight. Running short of ammunition and being hard pressed by the enemy, he sent word to some of my command for ammunition and help or that he would be compelled to give up the fort. A. P. McCord and John Lindsey, both of my old command, volunteered to return near the cabins in the rear of Fort Harrison, occupied by the enemy, where stood an abandoned ordnance wagon, which they had passed in their retreat from the fort. Protected by a line of skirmishers, under the command, I think, of Lieut. 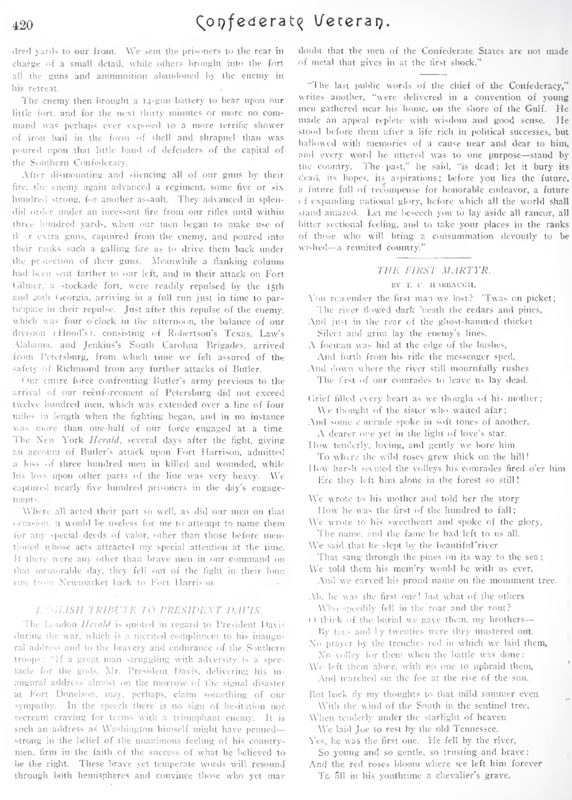 Landee, and under a heavy fire of musketry and artillery, they succeeded in securing each a box of cartridges, and, carrying the same under a heavy fire some half a mile to Col. Shepherd’s men and throwing the boxes upon a dismounted gun and bursting them open, the cartridges were eagerly gathered up by the brave soldiers to renew the firing, which had almost ceased. Rallying a few men who had escaped with me from Fort Harrison, I hurried to the assistance of the 2d Georgia. Upon my arrival in the fort, finding that Col. Shepherd had been severely wounded, I assumed command. Finding the enemy from sixty to one hundred yards in our front and partly concealed behind weeds and bushes and our ammunition running low, I had the men to withhold their fire until a small force, I think under Lieut. Hines, of the 2d Georgia, led by John Lindsey and A. P. McCord, of the 17th Georgia, and James DuBose, of the 2d Georgia, could deploy as skirmishers down the breastworks toward Fort Harrison. At a preconcerted signal the skirmishers crossed the works with that much dreaded Rebel yell, firing into the flank of the enemy, while our little band in the fort poured destructive fire into his front, which caused about three hundred of them to throw down their arms and surrender, while some broke and ran back to their main command in the woods, some twelve hundred yards to our front. We sent the prisoners to the rear in charge of a small detail, while others brought into the fort all the guns and ammunition abandoned by the enemy in his retreat. The enemy then brought a 14 gun battery to bear upon our little fort, and for the next thirty minutes or more no command was perhaps ever exposed to a more terrific shower of iron hail in the form of shell and shrapnel than was poured upon that little band of defenders of the capital of the Southern Confederacy. Our entire force confronting Butler’s army previous to the arrival of our reenforcement of Petersburg did not exceed twelve hundred men, which was extended over a line of four miles in length when the fighting began, and in no instance was more than one half of our force engaged at a time. The New York Herald, several days after the fight, giving an account of Butler’s attack upon Fort Harrison, admitted a loss of three hundred men in killed and wounded, while his loss upon other parts of the line was very heavy. We captured nearly five hundred prisoners in the day’s engagements. Where all acted their part so well, as did our men on that occasion, it would be useless for me to attempt to name them for any special deeds of valor, other than those before mentioned whose acts attracted my special attention at the time. If there were any other than brave men in our command on that memorable day, they fell out of the fight in their long run from Newmarket back to Fort Harrison.